Researchers say they have found a link between sleep apnea, daytime drowsiness and heart disease. 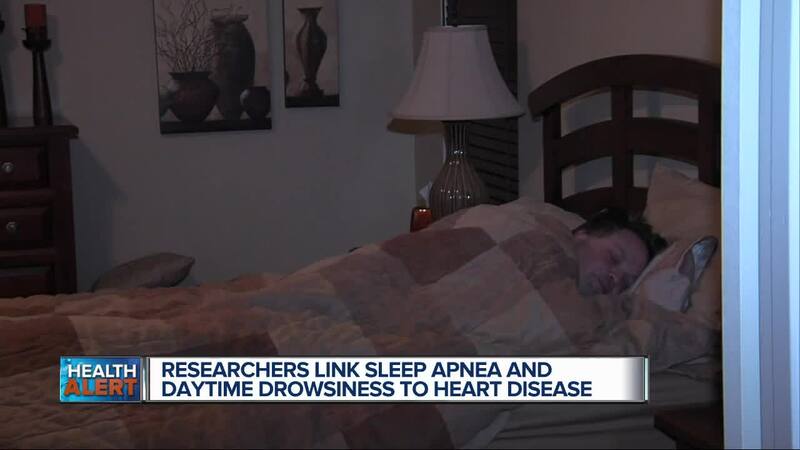 (WXYZ) — Roughly 18 million Americans have sleep apnea. But for those who also struggle with daytime sleepiness, a new study finds this could up your risk of developing heart disease. Sleep apnea is a potentially serious sleep disorder. And I’m very familiar with it because I have this condition as well. Now what happens at night when you’re sleeping, is that your breathing stops and starts. Now there are different types of sleep apnea that have different reasons for this happening. But Obstructive Sleep Apnea is the more common form. This is when your breathing gets interrupted because your throat muscles have relaxed and are now blocking your airway. And this can happen hundreds of times while you sleep. Because of this, your health can be affected in many ways. You may struggle with daytime sleepiness, difficulty paying attention, irritability, and it may also affect your heart. Now looking at this new study, over 1,200 people over 40 years old were followed for nearly 12 years. They all had moderate to severe obstructive sleep apnea. Researchers found that those who were excessively sleepy during the day were more than three times as likely to develop heart failure. And during the study’s follow-up period, they were twice as likely to experience heart failure, a heart attack, stroke, even cardiovascular death. Watch your weight. Extra pounds can collect around your airway which can obstruct breathing. For some folks, getting to and maintaining a healthy weight can actually reverse their sleep apnea. Be sure to exercise. 30 minutes of moderate exercise most days of the week can really help ease sleep apnea symptoms. If you smoke, please quit. Besides the numerous health benefits you’d gain, smoking can increase swelling of the airway making sleep apnea worse. Be sure you are treating your sleep apnea. The most common device is the CPAP machine, which is what I use.